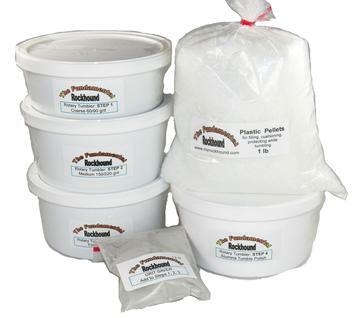 Generally, people use mixed sized grit for tumbling and straight grits for laps. You can use straight grits for tumbling if that's all you have, but do not use mixed grit on a lap. 46/70 is extra coarse. 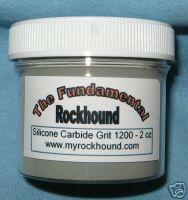 Use it when you have heavily pitted stones or agates with a crust on them. 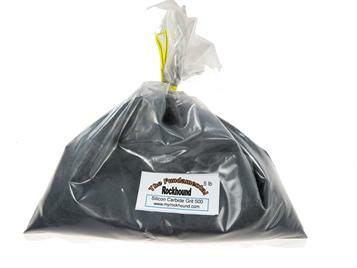 This is coarse grit, the most popular first grit for tumbling. 150/220 is the medium stage and run after the 60/90. The coarse and extra coarse grit shapes the stones and gets rid of the rough. The medium grit starts preparing the stones to accept polish. This is our fine grit. We've completely done away with sizes 400 and 600. This saves you from buying a complete grit stage. Single use for a 3 lb tumbler is four ounces each of coarse, medium, and fine grit and two ounces of aluminum oxide tumble polish. Single use for a 6 lb tumbler would be double the above measurements. 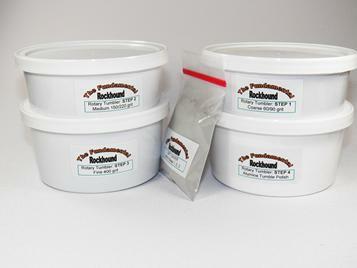 These are packaged and include the same items as above with the addition of an extra coarse 46/70 step. Unless you email us in advance with your order so we can send you a personalized invoice, if you make multiple purchases you will most likely be overcharged postage. We always refund the excess, so you don't need to worry about that, but we still want to offer packages of our most popular items; that way you will only have one shipping charge and there won't be a need for a refund later. 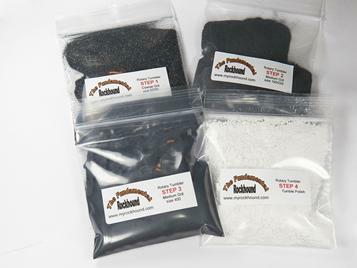 Following are a few grit kits that include plastic pellets and ceramic tumbling media. 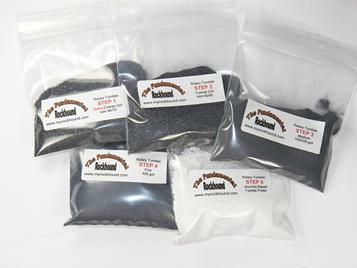 The ten pound grit kit consists of one pound of each: 60/90 coarse, 150/220 medium, 500 fine, 1.2 ounces of grit saver, and a half pound of our standard alumina based tumble polish and basic tumbling instructions. 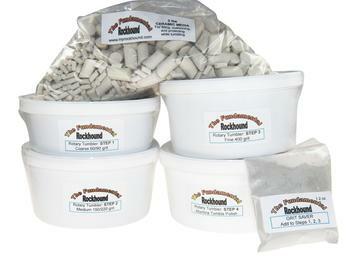 Please note - the last option that says 1 lb of each is for one lb pellets and one lb ceramic.